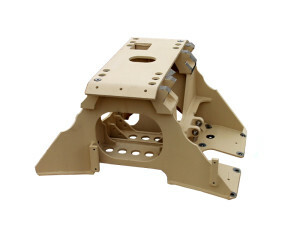 A major military contractor needed fast turnaround on a newly designed sub-frame for a tactical support vehicle. Because of the expedited timeline required and our proven ability to manage all aspects of such a project, we were selected to produce this challenging design. Each assembly is comprised of fifty four components. One team was responsible for acquisition of raw steel, laser blanking and forming components while working through a variety of manufacturability issues with our customer. Simultaneously, our technical team quickly designed and produced robotic tooling for multiple robotic welding cells to produce six sub-weldments. These were then combined to create the final weldment. 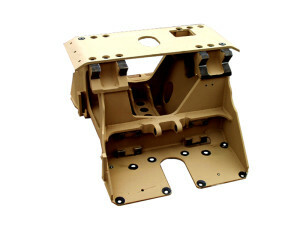 Controlling the effects of weld shrinkage and distortion was critical to this type of weldment. Our many years of experience proved invaluable because no time was available for solving issues created by unanticipated warping. Once released for production, we were responsible for daily on-time delivery of fully welded, machined, 100% dimensionally verified, and CARC painted assemblies. Processes – Laser blanking, Press Brake Forming, Single & Dual Arm Robotic MIG Welding, CNC machining, and CARC coating. Tightest Tolerances – +/- .002″, post weld machining and +/- .015” without machining. Quantities – Production lot sizes of 25 pc to 75 pcs.